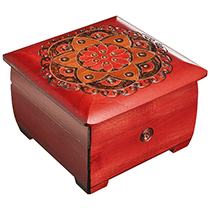 Large square trunk with Chakra design with Brown base color and Red & Blue accents. 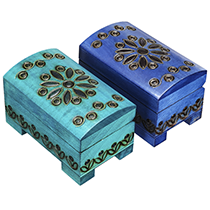 Features legs, brass inlay, and lock with key. 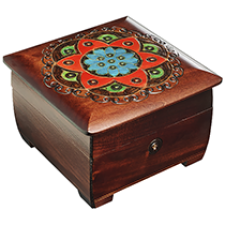 Large square trunk with Chakra design with Dark Brown base color, red, blue, and green accents. 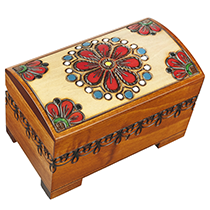 Features legs, brass inlay, and lock with key. 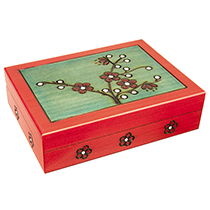 This is a clean and elegant wooden box with strong traditional roots. 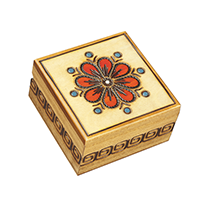 A timeless box that is suitable for all occasions, with brass inlay accents. 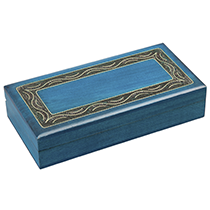 This box comes in assorted colors.